Viktor Frankl, founder of logotherapy, also known as the Third Viennese School of Psychotherapy, developed a paradigm in psychology that focuses on the importance of meaning in life. 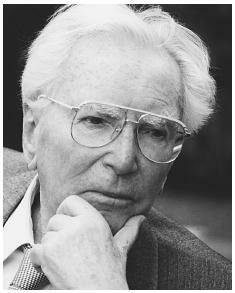 Viktor Frankl was born in 1905 in Vienna, Austria. He earned his M.D. in neurology and psychiatry and his Ph.D. in philosophy from the University of Vienna. During World War II he was sent to Theresienstadt and then Auschwitz. His book Man's Searching for Meaning (1963) is well known. Frankl was inspired by the existentialism of the twentieth-century German and Swiss philosophers Martin Heidegger, Karl Jaspers, and Ludwig Binswanger. Frankl died in 1997. Mindful of the finitude of human existence, Heidegger's thinking dwells on death as humanity's final boundary. Clearly death is a reality for all human beings and poses a challenge to humans' coping skills. "Logotherapy, unlike other existential systems, is basically an optimistic, future-oriented system, focusing on human freedom and the multitude of possibilities for human beings to find meaning" (Bulka 1998, p. 114). Logotherapy emphasizes the transitory nature of life and points to the meaning of the journey, thus avoiding the more negative aspects of existentialism by injecting hope, meaning, and values into the therapeutic dialogue. In order to understand life's ephemerality, one must first understand the nature of time in the lives of human beings. It is critical to understand that time only goes in a single direction. Thus, the gift of time from one person to another is a gift that cannot be exchanged at a department store but is a permanent expression of human potential. Frankl notes that, "The meaning of human existence is based upon its irreversible quality. An individual's responsibility in life must therefore be understood in terms of temporality and singularity" (Frankl 1986, p. 64). Life is temporary, yet each life is unique. As his clients became aware of the nature of the transitory nature of life, Frankl would offer this advice: "Live as if you were living for the second time and had acted as wrongly the first time as you are about to act now" (Frankl 1986, p. 65). He notes that as an individual understands the full gravity of time, he or she will recognize the full responsibility for living. Life, then, is a journey that reflects the experience of time. To face life only to reach the end of the day, the end of the task, the end of a journey is to live for the goal of dying. For Frankl, the focus is on the experience so that each event or task in life can become meaningful. He writes of the unconditional nature of meaning. Having lived through four Nazi death camps, Frankl offers the thought that all of life has meaning that can never be taken away from the individual. Only the individual can lose meaning. When this happens, the individual suffers feelings of meaninglessness that Frankl has identified as "existential vacuum." For life to have meaning, it must offer the experience of transcendence. Frankl notes that the word geistig (the spirit) refers to the capacity for self-transcendence, which is basic to human nature. The most meaningful experiences in life are those that transcend the individual and offer caring moments with others. The human spirit can also be experienced in the form of suffering. Frankl notes that meaning can be found in suffering by transcending the moment to understand the fullest impact of the experience. Frankl points out that "life can be made meaningful (1) by what we give to the world in terms of our creation; (2) by what we take from the world in terms of our experience; and (3) by the stand we take toward the world, that is to say, by the attitude we choose toward suffering" (Frankl 1967, p. 37). Viktor Frankl's psychological approach focuses on the importance of meaning in life. His Man's Search for Meaning (1963) sold more than a million-and-a-half copies in the United States. person's story reflects both who she or he is and what she or he has done. A funeral eulogy is a time to tell the "story" of the person. However, the task of grief, according to Frankl, is twofold: The first aspect is to find meaning in the story. What is it about the story of this person that offers meaning to the person articulating the eulogy? Meaning is often found by asking the question, What is it about this story that would be important enough to you to want to share with someone else? Frankl notes, "This leads to the paradox that man's own past is his true future. The living man has both a future and a past; the dying man has no future in the usual sense, but only a past" (Frankl 1984, p. 127). In the hearts of friends, the stories of the person's life reflect shared meaning. In this way there is a future, even after the death of the loved one. Paradoxically, the real hurt in grief is the fact that stories have endings. Yet when the story is understood in meanings, there are no ends, only meanings that can be passed on from generation to generation. The second task of grief is to understand the responsibility that is called for by the loss of a loved one, particularly in incidents such as a car crash where one person lives and the other dies. Frankl suggests that to honor the life of the deceased is to move beyond survivor guilt, which often accompanies this type of situation. Frankl suggests that there should be no such thing as survivor guilt, but only survivor responsibility. Each person has responsibility to transcend the circumstances of the incident and cherish the memory of the deceased. The work of Frankl offers a way of thinking about life as well as a therapeutic approach to being with persons who are dying and their loved ones. The goal of this process is the search for meaning. In meaning all of the transcendent life forces come together to offer more than mere existence as a human being. Bulka, Reuven P. Work, Love, Suffering, Death: A Jewish Psychological Perspective through Logotherapy. Northvale, NJ: Jason Aronson, 1998. Frankl, Viktor E. The Doctor and the Soul: From Psychotherapy to Logotherapy. New York: Vintage Books, 1986. Frankl, Viktor E. The Unheard Cry for Meaning: Psychotherapy and Humanism. New York: Washington Square Press, 1984. Frankl, Viktor E. Psychotherapy and Existentialism: Selected Papers on Logotherapy. New York: Washington Square Press, 1967.